Graduate students from the Music and Arts Technology Department and the Herron School of Art at IUPUI will be collaborating on two evening performances this December 1 and 7. Hear/Here the Future: Part 1 will take place beginning at 7:30 p.m., Thursday, Dec.1, in the Auditorium in the ICTC building at IUPUI. The performing ensemble will be the Telematic Collective, a media-arts performance group. 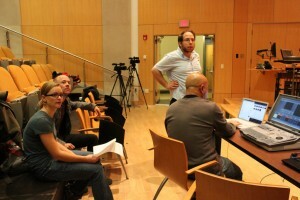 This 75-minute, telematic event consists of a multi-media, live performance with musicians on the auditorium stage along with large-screen video projections and the incorporation of live video feed and other visual artworks together with live musicians playing in Herron School Basile Center. 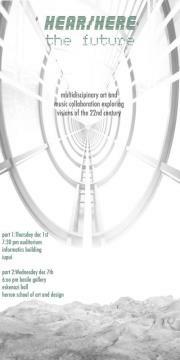 Also featured will be a performance over high-bandwidth Internet with the Salt Lake Electric Ensemble (SLEE). Hear/Here the Future: Part 2 opens at 6 p.m. Wednesday, Dec. 7 in Herron’s Basile Gallery and surrounding spaces.This part includes the opening of a multi-disciplinary visual art installation including video, sculpture, printmaking, multi-media and live music. The installation will remain for viewing through Dec.18., and will contain musical and video content from the December 1. Faculty leaders for the project are Scott Deal, professor of music and director of the Donald Tavel Arts and Technology Research Center, Department of Music and Arts Technology, IUPUI; and Craig McDaniel, professor of fine art and director of graduate programs at Herron. You are currently reading Concert: Hear/Here the Future, Parts 1 and 2 at Telematic Collective.